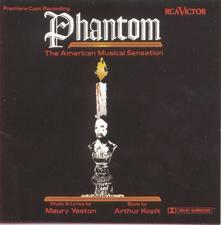 While there may have been a Phantom Of The Opera seducing audiences on Broadway in Andrew Lloyd Webber’s lush romantic score, another Phantom exerted a similar fascination around the country, but in songs written by the creator of Nine, Maury Yeston. Using the same source as Lloyd Webber’s show, Gaston Leroux’s 1911 gothic thriller, book writer Arthur Kopit fashioned a libretto that hewed closely to the original storyline up to a point, while Yeston composed songs that displayed as much romantic pull as its competitor’s. But two Phantoms on Broadway would have been unthinkable, so Kopit and Yeston decided to tour theirs around the country, and totally bypass New York. While there may be hope that it might one day settle on the Great White Way, the recording offers a tantalizing glance into their concoction..